Ampersand Gelato is an artisan gelato company centered around the idea of bringing things together. Whether that’s two flavors of gelato or the customer and a fun time, the company believes things are better when they’re shared. Wanting to capture the way favors can be mixed in a traditional gelato shop—but in an on-the-go way—each package is made up of a duo of artisan flavors that are designed to compliment each other. The name came from realizing that ampersands can look wildly different, but keep the same meaning, just like how gelato can be crafted with whimsical flavors, but still be a cold treat underneath it all. This in combination with the packaging concept and brand values tied the brand together. 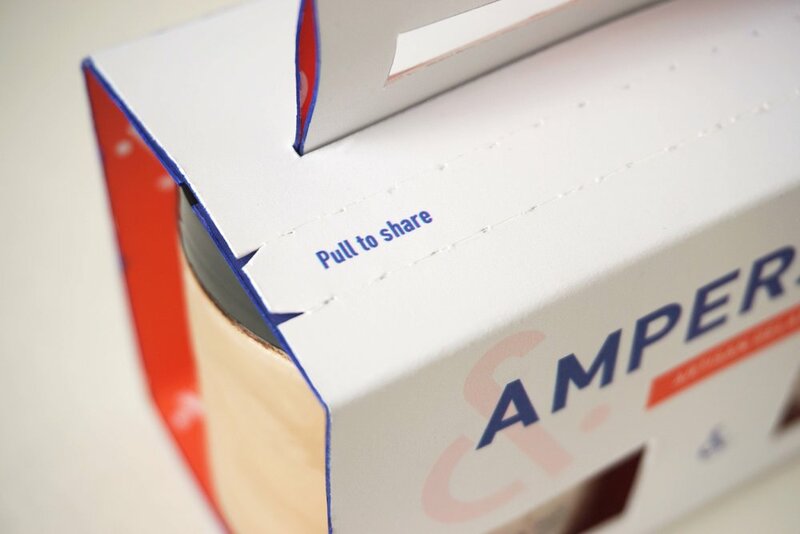 Ampersand is made to be enjoyed during a good time, so their brand had to be cheerful but also eye-catching due to the package’s small size. An abstract but meaningful logo, playful language, and bold colors elevate the brand to be the perfect treat to grab and enjoy. The packaging is custom designed to be portable with sustainability in mind. The gelato comes in small glass containers and the carton is one piece of paper—no glue or adhesive used—so it can be easily recycled after the product is enjoyed. Keeping the playfulness of the brand in mind, small touches like the handle, pull tab, and cut out windows were added.